Avast! 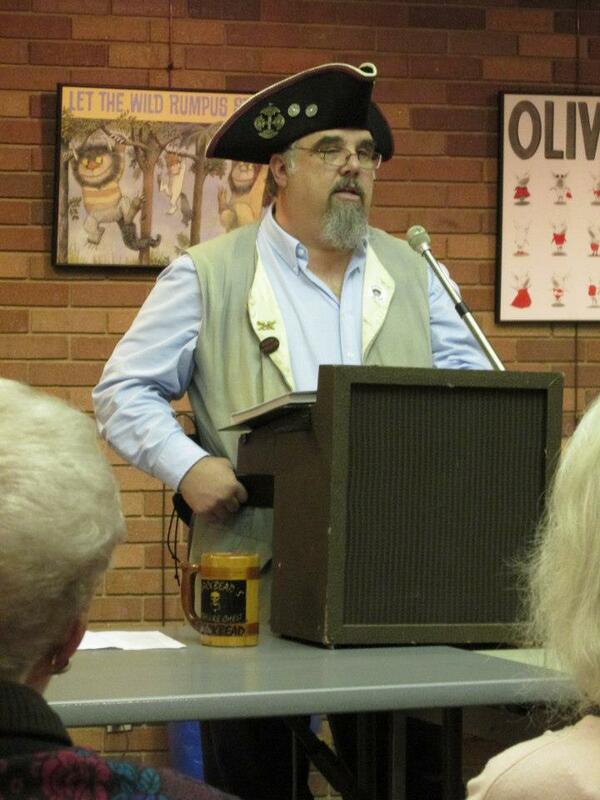 Mr. Steve Sanders, Fort Worth Chapter president, and Pirate Laureate of Seadog Slam, was the guest speaker at the February 9, 2013, Poetry Society of Texas meeting. His program was titled “200 Years of Pirates in Poetry.” He was a vibrant, animated, and entertaining speaker—and he is fluent in all things Pirate. He began by talking about the history of pirate poetry, reading examples from early works. Before he read and performed his own poetry, he donned a pirate’s hat, waistcoat and belt—and set a flagon of ale on the table—well, no ale, just the flagon. You can Like Seadog Slam on Facebook.